Remember to update your address information if you have moved or changed your email address, so that you will ensure getting all the necessary information about the event. You can make the all updates at the runner’s profile in which you have received an username and a password at the confirmation email when registered to the event. Entry fees are non-refundable in every case. Participants does not need to inform the organisation about possible cancellations before the event. The event office is located on Friday at Töölö Sports Hall (Töölön kisahalli), entrance from the Mäntymäentie-street. On Saturday the office is relocated at the Eläintarha Sports field, where the Minimarathon’s start is. All of the Minimarathon participants need to pick up their running numbers and a t-shirts from the event office before the race, latest on Saturday by 9 AM! The finish line for Minimarathon is located at the Helsinki Telia 5G Areena. After finishing the run every participant will get a medal and can enjoy some snacks and refreshments at the Areena. Unfortunately special diets can not be taken into consideration. After the run it is still possible to go back to Eläintarha Sports field to play and enjoy the activities. It will be open until 12 AM. Specific start times of Norlandia Minimarathon will be updated soon. Norlandia Minimarathon’s starts will begin at 9 AM on Saturday at Eläintarha Sports Field. Smaller kids will start first and the oldest kids last. Before the starts there will be a warm up for the run. The distance for every age group is about 1 km. Smallest kids can go with their parents or older siblings. Kids under 5 years can start in the first age group. The age groups will be allocated automatically according to the runners age on December 31st of the race year. NOTICE! No timing at any age group. Norlandia Päiväkodit offers Kids’ Park service for Helsinki City Running Day runners on May 18th 2019. You can run Norlandia Minimarathon with your child first and then bring them to the Kids’ Park. Professionals will take good care of them during your own run. The Kids’ Park is located at Töölö Sports Hall in the same building as the competition office. If you do not want your child’s name on the start list, you can register them with a nick name. In this case, remember which name you have used! Fill in the other information perfectly so you will get all the important information. During the event, our photographing partner Marathon Photos, will take pictures of all the runners before, during and after the race. All pictures taken will be available online after the event only for runners who have given their permission to photos while registering to the event. It will take about 2-3 days until the pictures can be found online. After the race Marathon Photos customer service will help you with all questions about the photos. The organizer has the right to use the pictures and videos taken at the event. The Start is at Eläintarha Sports field (Eläintarhan urheilukenttä, address: Vauhtitie 6, 00250 Helsinki). The route is about 1 km long, It is safe and guarded by adults. Kids can run with their parents if they wish. 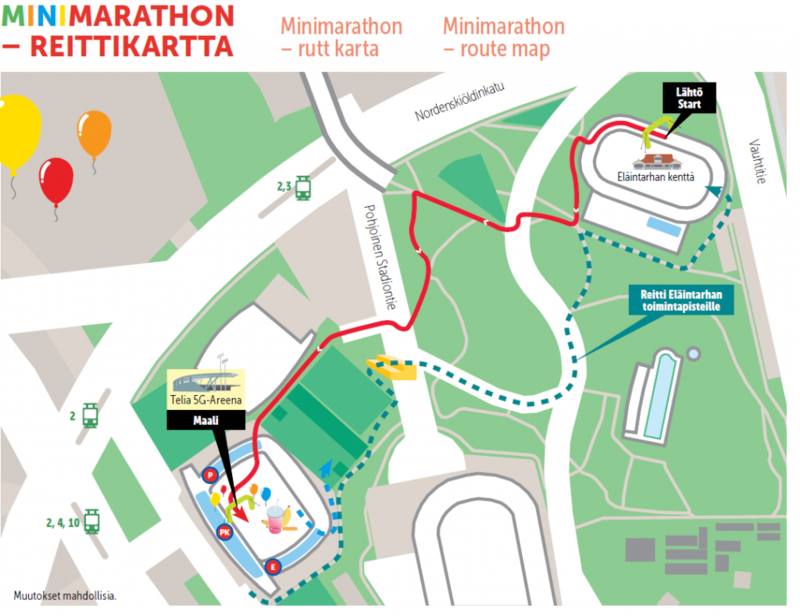 The finish area is located at Telia 5G Areena (address: Urheilukatu 5, 00250 Helsinki). The running number needs to be attached in front of a shirt and be visible during the whole race. The runners can keep their running numbers after the Minimarathon. The running bib, T-shirt and running package has to be picked up from the competition office during the opening hours. Please check the opening hours from the COMPETITION OFFICE section. Please note that you need to know your bib number before picking it up. Another person may pick up the bib and the t-shirt on behalf of the runner. In that case, please give your running number information to the person picking up your race package. Parents can access the Minimarathon finish area at the Telia 5G Areena from the same gate as the runners. Spectators can also watch Minimarathon from the Telia 5G Areena main section of the tribunes, which will be open from 8.30 AM forward. 9am-8pm (9-20) The competition office and Running Expo area is open at Töölö Sports Hall (Töölön Kisahalli) A-side of the hall (A-halli). The address: Paavo Nurmen kuja 1, Helsinki. Entrance is located at the eastern side (the parking area’s side). at 7:30 Minimarathon Competition office opens at Eläintarha Athletics field, Note the different location than on Friday! We recommended to use public transport as we don’t have any reserved parking areas for the runners.